ip. 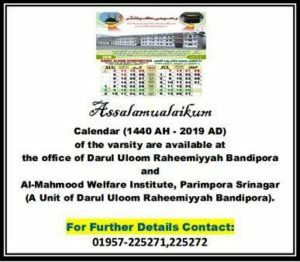 The Nazim (Administrator) of Darul Uloom Raheemia, claims that this Islamic University, will be the first of its kind in Jammu and Kashmir. Maulana Rahmatullah says that this University will consist of three main wings, that is, Hadees college, (Hadees-sayings of Prophet Muhammad (PBUH), Tafseer college (Tafseer-interpretation of Quran) and Fiqah college [Jurisprudence]. There will be hostel facilities for one thousand students, a mosque where at a time one thousand people can offer Nemaz and if a congregation is held at least five thousand people can easily sit there. There will also be one hundred family quarters and some one room sets, a beautiful guest house, a fully equipped library and a reading room attached to it. When Maulana Rahmatullah was asked how he would shape the plans about the launching of a full-fledged Islamic university and what were his financial sources, he maintained that the donation from the Muslims of Jammu and Kashmir was the sole financial source of this institution. As for the other question of launching an Islamic University on the Deoband pattern he has a surprising story to tell. He says that the prime need for such a big plan was the availability of land. 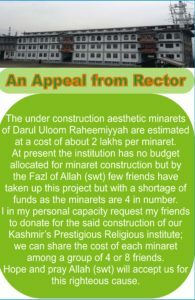 Darul Uloom Raheemiah is presently situated on a land which is not even sufficient to cater to the present needs while it cannot be extended from any side, because there is a graveyard and government hospital on one side whereas a stream and army barracks on the other side. The management of the Darul Uloom Raheemiah has estimated that at least fifty canals or 6 acres of land were needed, so they published an appeal in the Alnoor, (July, 1993) a monthly magazine published from Darul Uloom Raheemiah, for the same. Moulana Rahmatullah reveals that I was expecting that if people donated land, 50 canals can never come at a single site because there are only few families in the whole of area who have such a quantity of land situated at one place. But Allah is the Greatest. He knows how to deliver goods; only a couple of days after our appeal for donation of land, a pious widow approached us with a good news that she had decided to donate her 48 canals (6 acres) for the purpose. So this problem was solved. This fortunate pious lady was Aziz-u-Nisa widow of late Bashir Ahmed Baba. This pious lady who was in her eighties stressed upon us to complete the formalities of handing over of the orchard to us as early as possible and when these formalities were over, this good lady passed away on August 13,1993, just after a few weeks later when she donated the land. Aziz-u-Nisa was buried in a corner of this orchard as per her testimony. She was a pious Muslim and had taught Quran to hundreds of boys and girls of Nusu and adjacent villages of Bandipora. The site plan of the Islamic University has been drafted by the leading architects of Kashmir and has been sent to Devbandh for suggestions, after which this plan will be approved. For the time being, the management has started collecting the material for construction of the mosque, water tank and guest house in the first phase. A few temporary sheds have also been erected in the orchard where the educational activities have been started. Darul Aloom Reheemia, as Maulana Muhammad Rahmatullah Qasmi recalls was launched in September 1979, under the name of “Madrasah Islamia Arabia” after changing the name of Islamic Public School. Maulana Muhammad Rehamatulla, speaking of the days when he completed his studies at Darul Aloom, Devbandh, in 1979 said, “I was not even imagining that an Islamic Darsgah (School) can be launched so immediately, because whenever such a question arose, we used to prefer to work in any pre-establised Darsagh to make it grow on the pattern of Darul Aloom, Devbandh”. He further said that it was quite disheartening to see that not even a single Islamic educational school (especially of high education) in Jammu and Kashmir springing up, although it was predominantly a Muslim state. “In Bandipore, people used to stop me on road side and ask me to recite any Quranic verse as they were not believing me really to be a Hafizi Quran”, says Maulana Rahmatullah adding that ignorance of Islamic teachings was at its peak, so it was right and rather much needed step to launch an Islamic Institution. Moulana Rehamtullah made it clear that Darul-Aloom Raheemia is an independent institution with no links directly or indirectly with any political or non-political organisation. In the institution much stress is laid on the Islamic studies. The subjects are Tafseer (interpretation of Quran), Hadees (Saying of Prophet Muhammad SAW) Fiqa (Islamic Jurispradence) and Tajveed-u-Kirat (Right recitation of Quran). It is reported that when this institution was launched in 1979, the total number of students admitted was 11 and there were three teachers while the total annual budget was of the order of Rs 11,000. However, now i.e. in 1994, there are 225 students on roll and the strength of the staff is 37. The annual amount earmarked for the budget of the institution is Rs 13 lakh. The institution has so far produced 73 Hafizi Quran, 22 students who are Fareg-u-Tehseel Arabi (i.e. completed 20 subjects of Arabic course) that are Tafseer, Hadees, Asooli Tafseer, Asooli Hadees, Fiqa (all the four), Assoli Fiqa, Philosopy, Mantiq, literature, Sarf-u-Nahave (Mani Bayan), Seerat, History of Islam, Tajveed and Qirat, etc, 226 girls and 208 boys have qualified middle class with Denniyat (theology) as one of their subjects. Apart from this, thousands of pupil of various age groups have been taught how to read Quran here during these fifteen years. It may be stated that not limit of age is placed on those who wish to be imparted education in Quran. Mantak-I-Tayer by Shiekh Fareed-ud-Din Attar and the calligraphist is Moulvi Noor-u-Din. Fiqa-i-Akbar by Hazrat Imami Abu Haneefa (RA) and the calligraphist is Mir Fatullah s/o Mir Mazoor. This manuscript has been calligraphed in 1268 Hijrah. Virdul Muredeen a manuscript from by Hazrati Baba Dawood-i-Khaki (RA), the known desciple of Hazrat Sultan ul Arifeen Makhdoom Sahib (RA). A Quran in manuscript from written in golden ink. Kirmani by Abdul Razaq published in Beruit. Musand-i- Ahmad Ibin Hanbal publised in Lahore, Musand-i-Ibni Abi Lulee by Ibni Abi Sheeba published in Pakistan. Fathi-i-Mulhem publised in Pakistan, Tahzeebul Tahzeeb published in Lahore. Tafseeri Ibni Qaseer published in Berrut. Fi Zulali Quran published in Egypt. Al-Um by Imam Shafi (RA) published in Bombay. Al-Mugnai (Hambli Fiqa) published in Berut. Fatawa-i-Tatar Khania published in Pakistan. Shahnamai Islam by Allama Firdosi, Dairatul-Muarif-i-Islamia (Encyclopaedia) in arabic and its urdu translation. Complete file about important decision on Mirzayees (Ahamadies). 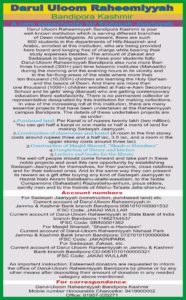 Tareekh Nam-ia-Harat and History of Kashmir by Hassan Khoihami. Darul Ifta Wa Qaza (The Court of Islamic Justice) This section of Darul Aloom is headed by Mufti Nazir Ahmad, a renowned Islamic scholar, who judges on to the questions about different problems in accordance with the Islamic laws and principles. Hundreds of Muslims throughout Jammu and Kashmir are benefited by issuing Fatawas every day. The locals attend the court personally. However, people from far-flung areas seek guidance through mail. Mufti Nazir Ahmad head of this court has qualified from Deoband in 1985 and has completed M.A. 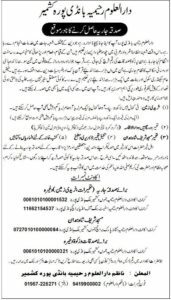 Urdu from Rampur University Up in 1987. Hailing from Bonjwa, Kishtwar Mufti Sahib is highly respected throughout the valley for this scholarship and intellectual integrity.